This was an experiment for a friend who loves crows, and even owned a pet crow in his youth. The topside is based on a photograph that he took of several crows in a tree. It is meant to be muscular and visceral foliage blending into stormy crow-filled skies. Crows at sunset, just before they migrate. In one of Van Gogh’s last paintings, “Wheatfield with Crows”, the crows are supposed to be symbolic of death and rebirth. The bottom side of the deck is a pair of crows at night. 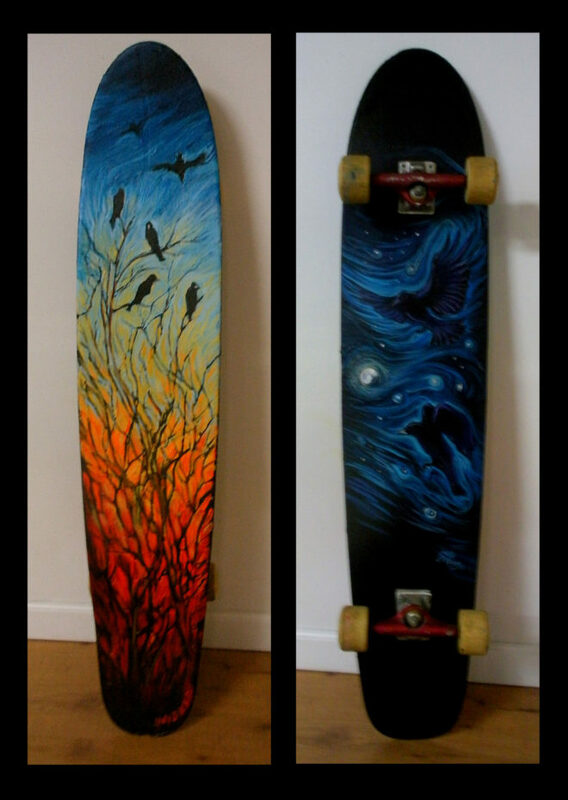 It reminds me of airbrushed 1970’s van-art but the intention was to execute it more like Van Gogh’s starry night. One interesting thing about crows is that you rarely see them alone – they seem to hang out in pairs. Yes, they mate for life, but they hang out in pairs or groups because they are social animals and recognize that, for their purposes community is stronger than solitude. It’s fascinating to watch a pair of crows working together to open a container or protect their babies. If longboards had a third side, I’d do one of a series of crows doing that funny Charlie Chaplin drunken dictator stagger when they walk across streets. Or maybe crossing Abbey Road a là the Beatles. I painted over the grip tape and stickers with acrylic – I was too lazy to remove it, but I thought it would add some nice texture. Then I coated the whole thing in several coats of resin and about a half-inch of resin. Resin is tricky to work with but it gives an incredibly durable albeit slippery surface. Good thing there’s clear grip tape.